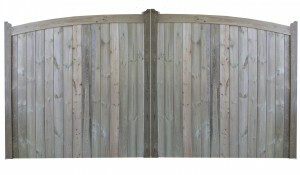 High Grove Entrance Gate - Blamphayne Sawmills Ltd.
Made of top quality Scandinavian Redwood. Planed all round, rebated frame with TGV cladding. The Highgrove Gate is also available in Iroko Hardwood. Softwood Highgrove gates are pressure treated with Tanalith E in a natural wood green. Sizes range from 900mm x 900mm to 1800mm x 1800mm per leaf.